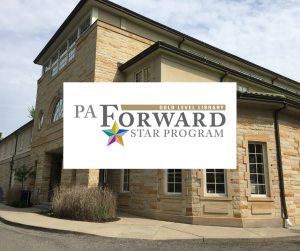 The Sewickley Public Library has been awarded a gold star by the PA Forward initiative of the Pennsylvania Library Association. The initiative recognizes libraries who are helping citizens of the Commonwealth achieve five essential literacies necessary to succeed as citizens, parents, students, employers, employees, and consumers. Those five literacies are Basic, Information, Civic/Social, Health, and Financial. The gold star is the highest level of recognition within the PA Forward program. To read more about the value of Sewickley Public Library, and its achievements in programming and services, visit the library’s website at www.sewickleylibrary.org to read the 2018 annual report just released. You can also pick up a hard copy at the library’s circulation desk while supplies last. Libraries are universally recognized as models of cost-effective service, stretching the public’s resources through sharing books, computers, DVDs, facilities and expertise. The Sewickley Public Library generated $8.7 million in value to the Quaker Valley community in 2018 through these shared resources. For every dollar of funding provided, the library generates a return of about $7 in revenue into the community –an excellent return on investment for donors who choose to invest in their community through a gift to the library. More information on supporting the library through an annual gift, an endowment bequest, a memorial or honor designation for a friend or neighbor, or other donation, please visit www.sewickleylibrary.org/donate.